You will learn a little more and go a little deeper! 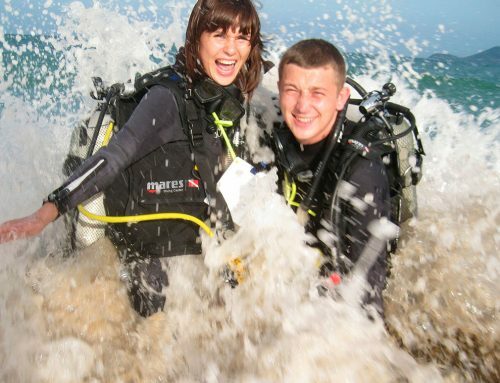 Take the next step with the PADI Advanced Open Water or Adventure Diver course! You would complete some Adventure Dives to become more confident, get a “deeper” understanding of scuba diving and engage in specialty dives, each one covering a specific topic/underwater activity. Each Adventure Dives is credited as the first dive of each PADI Specialty Course corresponding, for the one who want to “focus” their diver’s education. To enroll into PADI Advanced Open Water Diver course/Adventure Diver course (or Junior Advanced Open Water Diver/Adventure Diver) you must be 12 years old or older, in good physical health, and certified Open Water Diver (or similar entry level from other scuba diving agencies, contact us). To learn more drop in to our Nha Tang PADI Dive Center located at The Sailing Club Vietnam on Tran Phu Street. Talk to any of our Sailing Club Divers staff about what dives are available to you in Nha Trang. The Advanced Open Water Diver course is divided in two components and conducted over two or three days: complete the Underwater Navigation and Deep Dive + 3 other Adventure Dives of your choice and become certified! Knowledge Development; very “straight forward” with only some Knowledge Reviews to complete in our classroom or through online independent study before joining us (PADI e-learning or “Touch” application for tablets, ask us about details). 2 or 3 Adventure Dives from our boat and under direct supervision of your Instructor. Please see below which Adventure Dives are available! Ratio: maximum two students per Instructor. Including: full equipment rental; digital manual and certification fees;transfers to and from swimming pool and boat; lunch, snacks and refreshment when on board; marine park fees and boat insurance. Including: full equipment rental; digital or paper manuals and certifications fees;transfers to and from swimming pool and boat; lunch, snacks and refreshment when on board; marine park fees and boat insurance. Knowledge Development; Knowledge Reviews to complete in our classroom or through online independent study before joining us (PADI e-learning or “Touch” application for tablets, ask us about details). 3 Adventure Dives of your choice from our boat and under direct supervision of your Instructor. Please see below which Adventure Dives are available!